Shiraz by Summerfield of Pyrenees. The palate fills with beautiful tannins, dark fruits of plums and berries, spice, chocolate and mocha, while finishing with great length. From fruit grown to the original farmstead which was broken up to give birth to Taltarni. Originally planted to Shiraz in the 1970s, Summerfield vineyard borders Taltarni. A warm and rich well constructed wine of continuous spicey fruit, noticeable flavour intensity and excellent cellaring potential. Ian Summerfield felt that Walter Henning had exposed him to an enterprise that could bring the family prosperity amidst challenging times for the farming industry. Planting grapevines seemed a viable alternative to the other crops Ian and his family had previously produced, and he proceeded to plant 10 acres of predominantly Shiraz vines, which his two sons would grow up amongst in the years to come. Ian's plan was to grow the grapes with a view to selling the harvests to Taltarni or Seppelts, and he proceeded to sell the early harvests to Great Western (now Seppelts) and Chateau Remy (now Blue Pyrenees). However, he had faith that the winemaking industry was going to take off, and acknowledging that he had little understanding of how to turn the grapes into wine, Ian set about building his own winery and sort the advice of a winemaker with veritable celebrity status in the industry, Leo Hurley. Hurley's tutelage helped cement the Summerfield ethos of minimal intervention with the vines, and it is this methodology that Ian refers to constantly today. Additionally, Drew Noon - who was appointed State Oenologist and is one of Australia's few Masters of Wine - played an important role in the development of Summerfield. Noon continues to be involved with the Summerfield family, returning frequently to the property at Moonambel. Ian's eldest son was encouraged to pursue greater interest in winemaking. Craig commenced his studies in viticulture and winemaking in Maryborough, and went on to study at Roseworthy Agricultural College in Adelaide. Craig's commitment to acquiring an academic understanding of viticulture and winemaking further inspired Ian to plan, build and develop the winery. Craig's academic understanding of oenology perfectly complemented Ian's practical experience and knowledge of the grapes. Ian Summerfield had come to love the vines and nurtured them with the dedication and commitment a parent has for a young child. Consequently, it wasn't until recently that he relinquished his position as head winemaker at the winery. 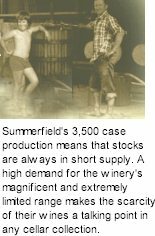 In 1987, Ian's youngest son, Mark Summerfield, was visiting the winery from Adelaide on the premise that he would be staying a short time before moving on to Sydney. But Mark found his father's passion for the grapes and for the business infectious and has remained at Moonambel since. Mark has learned the art of blending and winemaking under his father's guidance, ensuring the preservation of the techniques and philosophies Ian developed with Hurley and Noon. 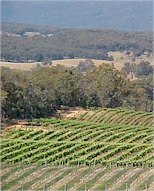 In late 1998 Summerfield won 4 silver and 3 bronze medals in Melbourne, Perth, Ballarat and Seymour for the '97 Shiraz, Cab Shiraz and Cab Sauvignon. In 1998, James Halliday selected Summerfield 1997 Shiraz in his top 100 wines in Australia, and made special mention of the Cabernet Sauvignon. In 1999, The Age newspaper published it's Epicure 'Uncorked' section listing the Summerfield '97 Shiraz as their pick for the 'Best Red'. The phones rang hot and the cellars were emptied in two days. The article went on to say "A terrific mouthful of Pyrenees magic. This is a big, rich red that's already fascinatingly complex, with blackberry, vanilla, fruitcake and mint aromas and flavours. It's smooth and inviting and great now, but is sure to unfold much more if cellared, drink over the next 15 years and more!"